Well, Saturday evening apocalypse really. 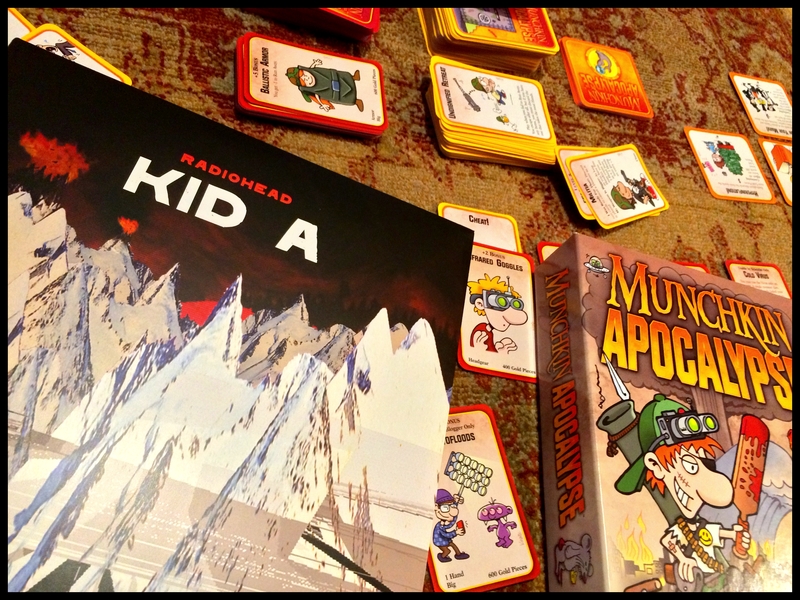 Well Saturday evening and Munchkin Apocalypse to be precise. 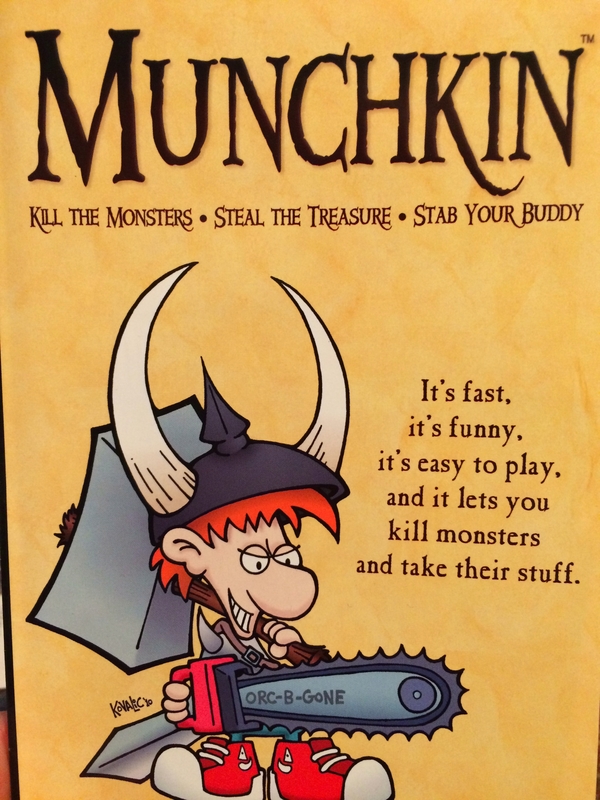 My son and I started playing the Munchkin games about 5 years ago, to paraphrase their blurb, they give you all the fun of killing monsters and taking their treasures, without any of that boring role-playing stuff to get in the way. As a long time dyed-in-the-wool role-player it was great to stumble across these games, they’re fast-moving very well worked-out and often laugh-out-loud hilarious. 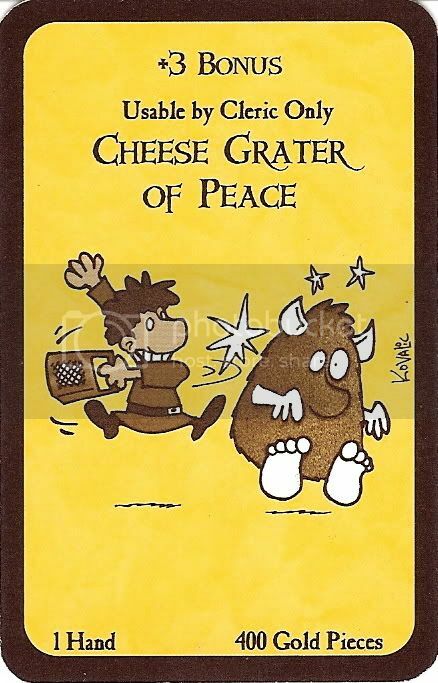 Almost every single card is based around an awful pun / play on genre stereotypes and wonderfully illustrated by John Kovalic. They took me straight back to the early 80’s when buying anything from Steve Jackson Games* was usually a sure-thing for a good time, Illuminati (still got that one), OGRE, Car Wars** and all the myriad expansion packs for it. What set these games aside was the flashes of humour they showed in what could be, quite a po-faced hobby – me more so than anyone, don’t get me started on the Great Wandering Monster Falling-Out of 1983!! 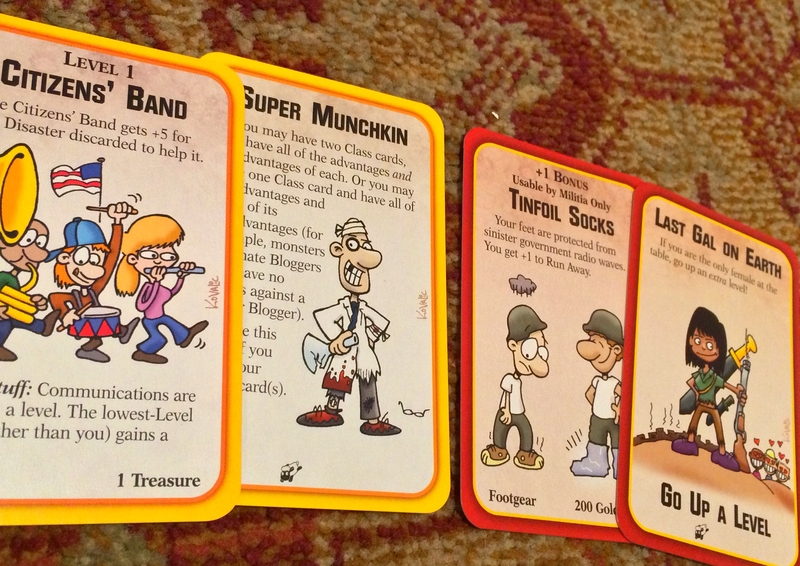 There are a number of Munchkin games, all themed differently as well as the basic fantasy-themed one, Munchkin Fu, Munchkin Cthulhu, Star Munchkin etc some of which we’ve tried, but Munchkin Apocalypse is our favourite – basically the world’s ending, we’re all going to die, so let’s kill the monsters and loot their treasure! It’s a conceptually complex thing. 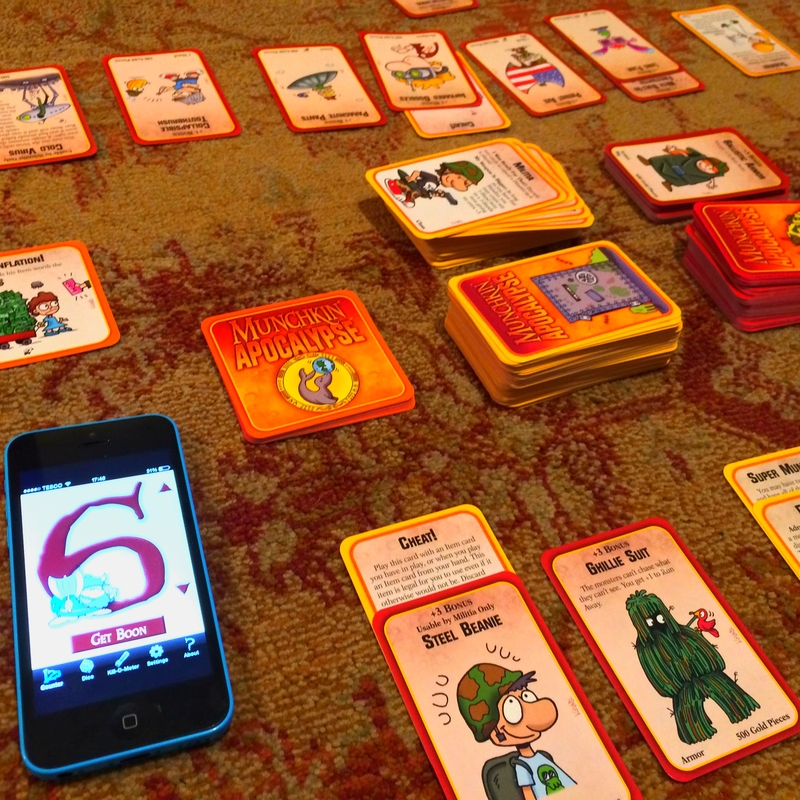 So we fire up the Munchkin level-counter app on our ‘phones, I choose the sounds (I am a tyrant, there is no democracy here) and geek daddy and son get to play a very silly game together on the floor. Long may it roll. *usually in those little black plastic boxes. **thousands of little cardboard pieces, great huge maps and game mechanics that taught me more about physics than any teacher ever managed since. Will have to check it out, age 10 ok do you think? I’d say possibly a couple years too young for the humour and the gameplay. It is truly, truly great though – lots of silly (and occasionally quite racy) humour. I have no doubt you’d love it. I don’t know much about card games like this. We had a friend in Saskatoon who was right into this stuff, games from a company called Something Awful or something along that lines (I don’t know the actual name). We played one, it was alright. My son is showing interest in Pokemon cards – there’s a club at school. Is that the same thing? I honestly have no idea. I’m a fantasy nut, son of a fantasy nut, father to a fantasy nut. This is where we’re at. My son really liked all those Pokemon things, never quite got them myself. 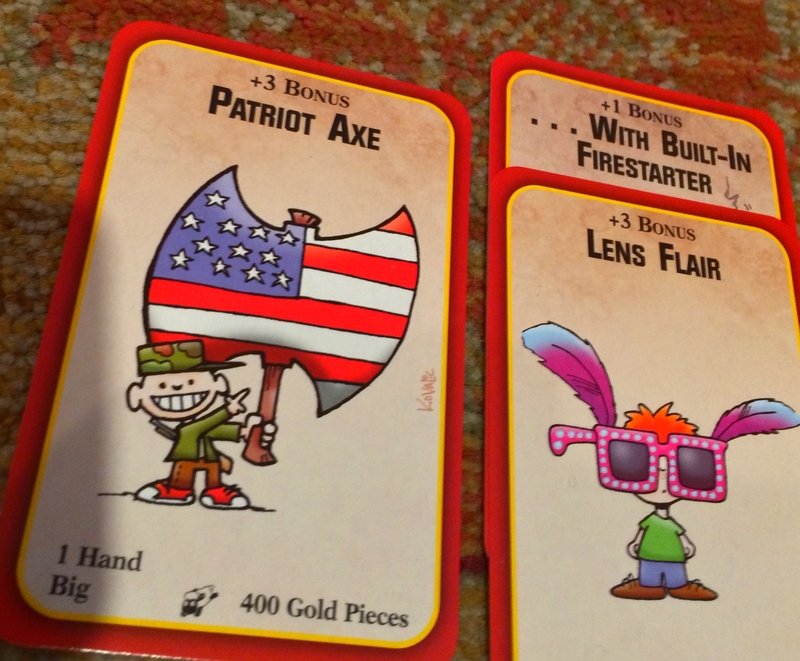 Oh I’m a fantasy nut too, I just (for whatever reason) never got into the card games. I did play an RPG in high school… does that count? Totes worthwhile! (as I think the kids say these days). Although that could be construed as being a bit monsterist. I had a few Saturday Night Apocalypse episodes myself! But that was due to beverage consumption(ahem)…in the old days! Good bonding Time with your son! My twin teenage girls hit 16 years young tomorrow and it was just like yesterday they were born! Wednesday night (when all the farmers came into town for the market) was apocalypse night where I grew up – I’ve seen several proper Wild West-style brawls. My lad is 15 – scary how fast it flies! Time Waits For No One….damn it! Tom Waits for everyone though! I played Car Wars, my one character drove a 1967 Ford Mustang with a laser mounted on the roof. Great fun, great memories. Happy days – I still reach for the controls for the twin roof-mounted rocket launchers when someone cuts me up in traffic! And the oil dropper when someone gets too close. Car Wars! I loved poring over the rulebook of that. But I could never get my pals into it because we could never play a game where the cars stayed intact long enough to actually fight each other. Mad Max it was not. 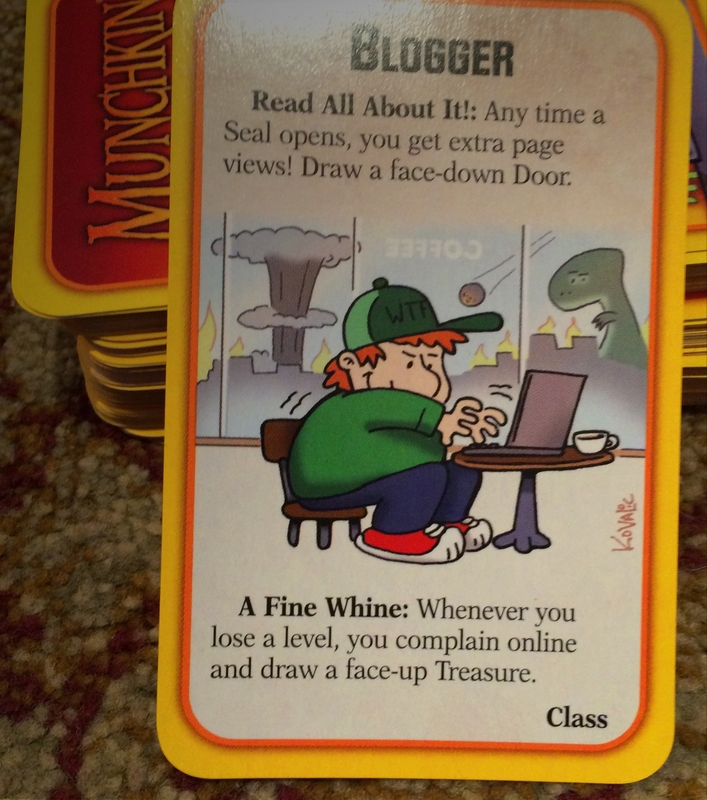 I rather think you’d like Munchkin. I’m massively intrigued! I’d noticed it on Amazon before but didn’t know enough about it. But I think I might give it a go on your recommendation. Seriously, you need it in your life. It’s fast, easy to learn and very funny – we love it.